Still a renter's market, as supply outpaces demand. Jill Kerby, Finance Journalist, commenting on the latest Daft research on the Irish property market. Young, prospective home-buyers with steady(ish) jobs, no debt, a bundle of cash burning a hole in their accounts and a serious case of nesting-syndrome, are back on the weekend viewing circuit, say estate agents. They tramp in and out of three-bed semi's, city townhouses and dez-rez river-view apartments in all our major cities, then mark them off the listings they've torn out of the weekend's property pages. It's Spring, for crying out loud; estate agents and property supplement editors take note: it's what singletons and young couples do on sunny Saturday and Sunday afternoons in April and May when they can no longer suppress the image of their future offspring's carriers, buggies, cradles, cots and toys filling their 500 square foot rental apartment or tiny city centre cottage to capacity. It does not represent a 'green shoot' or other sign of 'recovery'. The sensible viewers - at least the ones who read the rest of the domestic news - will ignore the self-serving 'we're out of recession' nonsense, and keep paying over their rent. They at least know that unlike friends and colleagues who bought property in the bubble years, they can always hand in their notice to their landlord and get a nicer place if they want, probably at a much lower price than what they're paying for the past few years. If they lose their job, they've got a cushion of cash they can use to take the time to find another one, to retrain, to set up a business or immigrate. 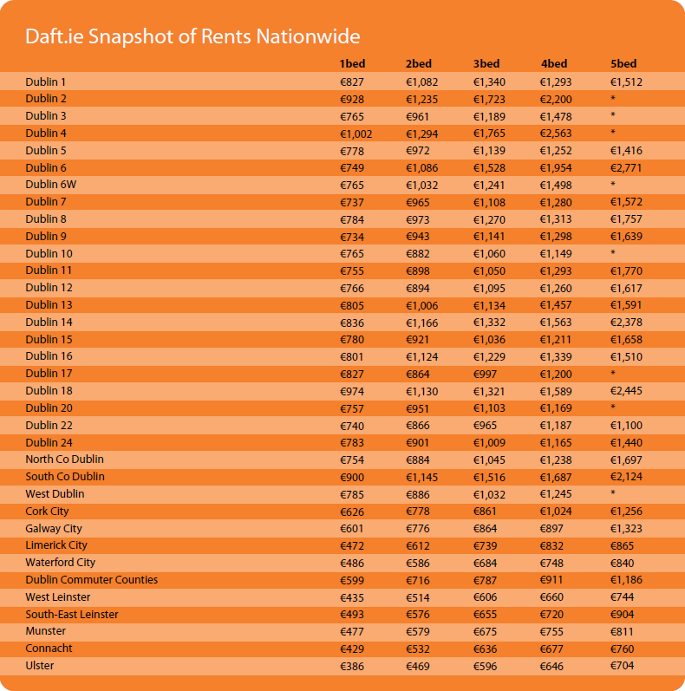 The latest quarterly Daft.ie rental figures clearly show that this is still a renter's market, and that this isn't going to change so long as supply outpaces demand. Other recent reports, from the CSO, the Irish Property Investment Report from the Irish Mortgage Brokers and PropertyWeek.ie and the ESRI/PTSB House Price Index also show that residential property prices are grossly overvalued and still falling and that there is still strong outward migration and unemployment. (Using yields as the starting point, the highly technical Irish Property Investment Report suggests that investment properties are currently overvalued by an average of 37% in Dublin, 43% in Cork, and 39% in Galway). Throw in the reluctance of the banks to lend, the bad, bad news about the euro and indebtedness here and in the eurozone, and the longer term rental market starts to look a little firmer. Property investors, with buy-to-let residential properties in Dublin and Cork cities, can also take a little reassurance from these latest Daft.ie figures. 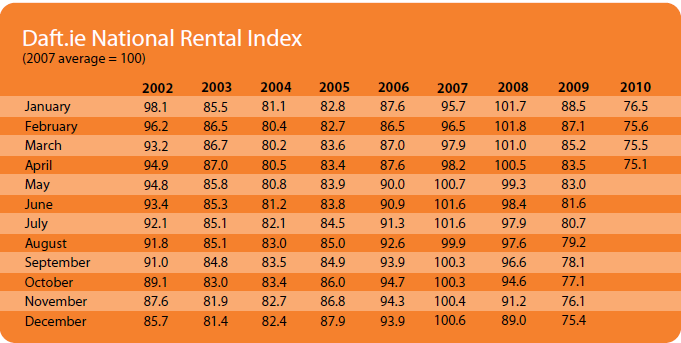 Their rents have stayed pretty static, with Dublin city centre rents actually up 1.3%, though other areas of the city and county are either neutral or down by 0.2% to 0.4%. 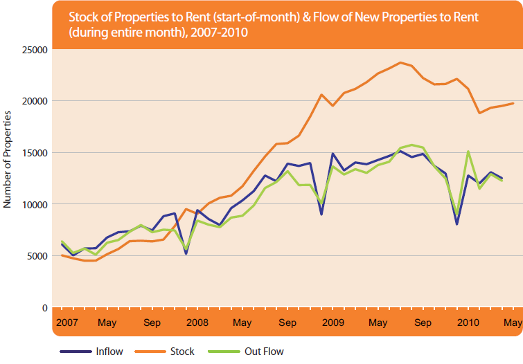 (Year-on-year, rents are still down in Dublin between 13.3% and 15.9%, depending on the area). If there's any good news for the rest of country, the Daft.ie figures show that while the fall in rents continues, it's at least at a slower pace than it was during the same quarter in 2009, when minus 4% and 5% was recorded. Aside from Cork City, landlords are still struggling this quarter. Their rental income is down 3.1% in Limerick city, 1.2% in Galway and 0.5 in Waterford. The year-on-year collapse in rental income is pretty shocking, given how borrowing rates have started creeping up, especially for the amateur landlords who may not have secured interest-only trackers or fixed rates. They are looking at fall of 11.8% in Cork, 8% in Galway, 12.9% in Limerick and 11.2% in Waterford. Landlords with weak hearts should desist from looking at Daft's estimate of the size of the fall since the 2007 rental peak. As someone who spent more than half my life as a tenant, first in Montreal, a terrific renting city, and then here in Dublin in the 1980s, I think the development of a strong rental market in Ireland is very welcome. The quality of properties has soared (even it the management of them often leaves something to be desired). Regulation isn't too onerous for landlords and provides plenty of flexibility for tenants. If there is a danger, it is that the loss-making nature of so many buy-to-lets in particular - national average yields are 3.6% overall - could result in a deterioration of the rental housing stock if amateur landlords find it increasingly difficult to square the rent they receive with the cost of servicing loans and maintaining or periodically upgrading their properties, a necessary expenditure if you want to command a higher price. The real economy, as opposed to the statistical one so beloved of economists, may be dis-improving more slowly, but it's going to take more than fractional improvements in the pace of unemployment, Exchequer tax returns, or even consumer confidence to restore it to a state of recovery that the ordinary person can recognize. And that's only going to happen when they see that foreign and domestic businesses are hiring again, exports and domestic consumption is strong, the banks are solvent and open for business, the deficit and national debt is being paid off, and the euro is stable. Until then, renters should be grateful that at least the size and quality of the rental market in this country is so robust: it sure beats the bedsit-land most of us lived in during the 1980s.